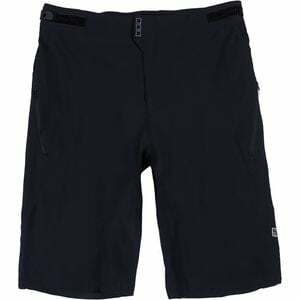 Product Condition: The Highline Short - Men's is in Excellent condition. These shorts were previously owned for three weeks. The following observations were made regarding these item. *They were tried on in indoors for an occasion. *There aren't any defects in them at all. *They got minor lint/dust, cleanable. *The original vendor tags are missing. *All items sold as is, all warranties void. The Sombrio Highline Menâ€™s Shorts are seriously lightweight and cool but theyâ€™re still miraculously way more comfortable than ridingâ€”and crashingâ€”naked. Made with stretchy Quattro Flex fabric that lets you pedal like a fiend and get aggressive when youâ€™re descending, the Highlineâ€™s perfect for ripping loamy lines in BC, shuttling the techy drops of Moabâ€™s Porcupine Rim, or exploring whatever singletrack loops you happen to call home. For obvious reasons, Sombrio skips any seams in the crotch area and reinforces all the high-stress areas with extra stitching to prevent blowouts when youâ€™re miles from civilization (or in the middle of it, for that matter). Laser-cut ventilation lets heat escape and pulls much-needed air through the shorts while you ride, and thereâ€™s even a DWR coating to shed moisture when youâ€™re ripping through tight trails on dewy early-morning laps.